"Texas spends a mountain of money on its roadways -- and it needs to spend more..."
"Any further delays in transportation improvements may compromise the state's budget and make future decisions more expensive and more painful." Texas Comptroller Glenn Hegar points the simple truth that transportation infrastructure spending boosts the Texas economy and the economic wellbeing of families. "Our roads and highways cost a lot -- but so do poorly maintained and inadequate roads, which make commerce and personal travle more expensive and even dangerout. Fixing and expanding our roadway system brings economic benefits as well," Hegar writes in the latest issue of Fiscal Notes, a publication of the Comptroller's Office. As we saw in Part I of this article, Texas spends a mountain of money on its roadways — and needs to spend more if we want to keep traffic moving across our rapidly growing state. Reliable transportation infrastructure is critical to economic development. Industries can thrive or die depending on the reliability and speed of their transportation options. A 2016 survey of corporate executives by Area Development magazine, for instance, ranked highway accessibility second among the top 10 site selection factors, just behind the availability of skilled workers. Highway accessibility has ranked first or second in importance in this survey for more than a quarter-century. Yet in Texas and across America, basic transportation infrastructure is aging and increasingly at risk. According to a 2013 study by the American Society of Engineers, inadequate roads could cost the U.S. economy more than 400,000 jobs by 2040, particularly in high-value and high-paying sectors such as tech and manufacturing. Efforts to expand and repair our roads also carry an economic impact, however — a large and beneficial one. As noted in Part I, Texas roadways face significant challenges. The state's population is expected to rise to nearly 45 million by 2040, yet traditional transportation funding is based on per-gallon motor fuels tax rates that have not risen since 1991, and ever more fuel-efficient cars have further depressed gas tax revenue. The Texas Department of Transportation (TxDOT) estimates it will require about $60 billion in the next five to 10 years to improve connectivity and traffic flow in Texas' urban areas, as well as an additional $20 billion for statewide connections and border-trade projects. For Texas motorists, the costs of inadequate roads are cumulative and personal. According to the transportation research organization TRIP, the average American motorist pays an additional $516 each year in added vehicle operating costs due to driving on poorly maintained roads. But many Texas drivers pay more, with additional costs averaging $838 in San Antonio, $815 in El Paso, $772 in Houston, $716 in McAllen and $549 in Corpus Christi. Investments in new roads, improvements and routine repairs can extend the life of the state's roadway system, preventing or postponing more expensive reconstruction while reducing transportation and commuting costs and improving access to goods and services. Transportation investment is an effective way to stimulate economic development. IHS Global estimates that every $50 billion invested in federal highways and public transit programs generates an average of $31 billion in personal income tax receipts and $6 billion in federal corporate tax receipts due to increased economic activity. Transportation spending affects both the level and geographic distribution of economic activity. Such investments yield near-term benefits in employment; a recent White House analysis cited job creation in the construction, manufacturing, retail trade and professional and business service sectors. Just as important, however, are long-term economic benefits including greater competitiveness, lower prices, higher productivity and higher incomes. While road construction costs have risen rapidly in recent years, this growth has slowed dramatically since the Great Recession ended, particularly in the all-important category of borrowing costs. As the national economy continues to recover, however, prices will rise. Any further delays in transportation improvements may compromise the state's budget and make future decisions more expensive and more painful. The Texas economy relies on the speedy, reliable and cost-efficient transport of components, finished goods and raw materials to and from state, national and international markets. Advanced communications and cost-cutting business innovations, such as just-in-time delivery and push-style distribution, demand ever-faster shipments. To learn more about Texas transportation planning and projects, see TxDOT's Texas Transportation Plan 2040. 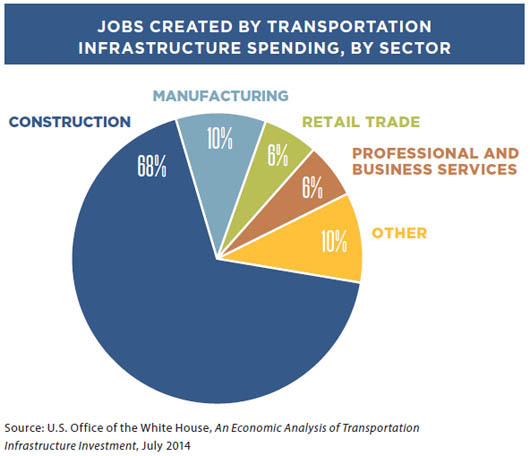 In general, transportation investment affects the economy in two ways: by increasing the demand for construction services and building materials, and by enhancing the connectivity of businesses and people. To examine such impacts in Texas, the Comptroller's office worked with Regional Economic Modeling, Inc. (REMI) to estimate the near- and long-term impacts of road spending between 2017 and 2040 in rural and urban Texas areas. The REMI team used TranSight, a dynamic transportation economic model, to examine the net efficiencies resulting from transportation spending. The exercise was based on four randomly selected counties in the Panhandle (Armstrong, Carson, Donley and Gray counties) and three in the Houston area (Fort Bend, Harris and Montgomery counties). In the Panhandle area, an additional $25 million for transportation infrastructure construction could create more than 300 jobs in 2017. By 2020, if the investment reduces the cost of transportation (including commuting as well as all other travel) and access to goods and services by just 2 percent, the project would yield 224 additional jobs in that year, lifting real gross state product (GSP) by $16.8 million. By 2040, a continued 2 percent reduction in costs could mean an additional 216 jobs and $20.3 million in GSP in that year. If the $25 million spending increase resulted in a 5 percent reduction in costs, the area could see 575 additional jobs in 2020, with an increase to real GSP of $43 million. In 2040, a continuing 5 percent cost reduction could result in another 552 jobs and $52.1 million in GSP. In the Houston area, by contrast, an additional $25 million for transportation infrastructure could add nearly 400 jobs in 2017. In 2020, again assuming a 2 percent reduction in the cost of transportation and access to goods and services, the area could see 29,400 more jobs and $6.4 billion in additional GSP. By 2040, the 2 percent reduction could mean an additional 48,000 jobs and $16.7 billion in real GSP in that year. If the additional spending creates additional lanes and other highway construction projects, in 2020 the Houston area might see a 5 percent reduction in costs and a resulting increase of 73,100 jobs plus $16.2 billion in additional GSP. By 2040, the 5 percent cost reduction could result in another 122,400 jobs and $43.4 billion in GSP. Selecting, planning and executing a transportation infrastructure project takes time. How much time depends on a number of factors including need, economic conditions, environmental issues and — most importantly — the availability of financing. The time frame from need identification to construction for any project varies but typically takes about four years. 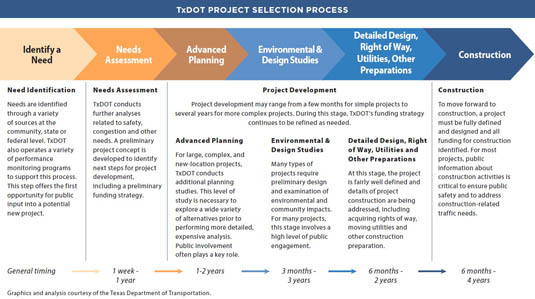 In addition to individual project planning, road construction in Texas is subject to longer-range planning processes, including the Statewide Long Range Transportation Plan (24 years); the Metropolitan Transportation Plan (20 years); Unified Transportation Plan (10 years); and the Statewide Transportation Improvement Program (four years).